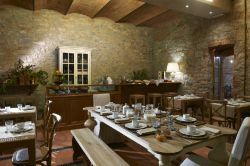 The farmstay Borgo di Pietrafitta at 4 km from Castellina in Chianti Tuscany, has inside of the manor house 8 exclusive double rooms, dedicated for those who would like to experience the authentic Tuscan lifestyle only for a few days, with a special bed and breakfast treatment. The rooms are situated on the first floor of the villa and can be accessed by a flight of stairs. 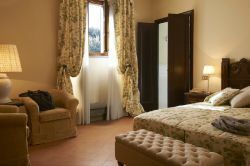 The Standard double rooms are in a totally relaxing and peaceful atmosphere with elegant terracotta floors and precious materials covering beds and armchairs are the perfect frame of a pleasant holiday. The Superior double rooms will offer you a lot of space to relax and pass your leisure time in complete liberty. The elegant countrystyle was cared in every single detail and will remind to the antique noble villas. All superior rooms have a huge bathroom with angle tub. Furthermore, each superior room is furnished with a electric water kettle.